If you know your Arizona history, you know that the Hohokam people didn't just live around 46th Street and Washington, which is where Pueblo Grande has been preserved. Their civilization spanned out all over the Salt River Valley, where Phoenix is nowadays, and way beyond. And so with every step you take anywhere in the Phoenix metro area, you are walking on ancient Hohokam ground. I call it all "Pueblo Grande" from anywhere you stand in the valley, looking in any direction - towards South Mountain, Camelback Mountain, the White Tanks, you name it. The Hohokams at Pueblo Grande. You're looking towards Tempe over the Salt River. South Mountain is in the background at right. This is 46th Street and Washington, Phoenix, Arizona. 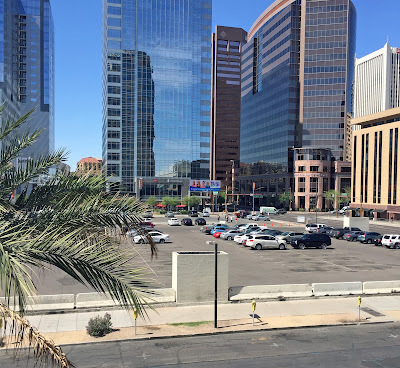 So, if you're wondering why it wasn't all preserved, well, it's because the city of Phoenix is on top of it. And if you live in or around the Phoenix area, that means under where you are right now, where your car is parked, where you work, where you go shopping. Yes, every inch was once one of the greatest, and largest, civilizations of the Americas. We call them the Hohokam, which just means "those who have gone". 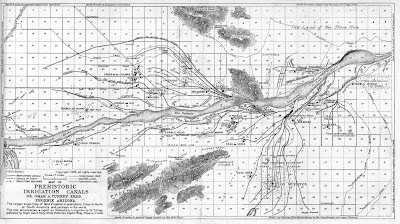 We really know very little about them, but they built some gigantic canals (bigger than the modern ones we have nowadays) and a lot of buildings in the Salt River Valley. 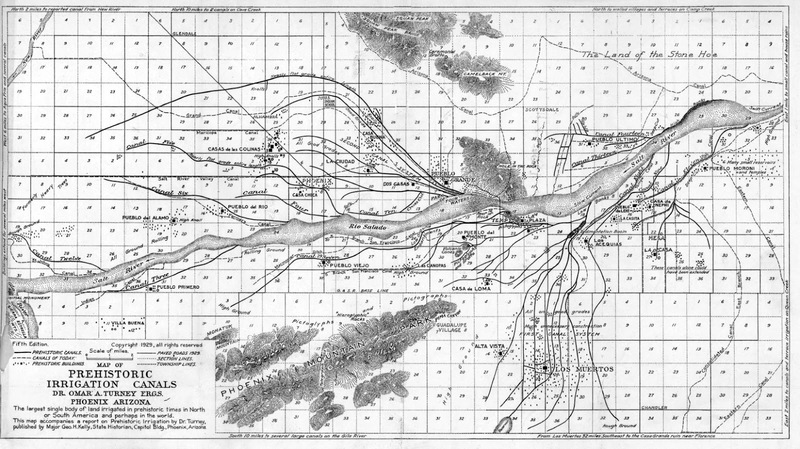 Map showing the Hohokam canals in 1929, Phoenix, Arizona. By Omar Turney. So the city can't not build on top of Hohokam ground. It isn't possible. But it can stop construction for a little while and give the archeologists a chance to take a look before a new building is built. And that's the hope for Block 23 in downtown Phoenix. Block 23 is bounded by Washington, Jefferson, and 1st and 2nd Streets. It's the location of the original Town Plaza in 1870, where the Fox Theater was built in 1931, where the downtown JC Penney's was built in 1953. And the archeologists have never really looked there, so this could be their chance. And it will be their only chance. The plan, as of this writing, May 2016, is to build a Fry's grocery store there. Exactly where on the block I have no idea, but any construction on Block 23 gets my attention. And certainly the attention of the archeologists of Pueblo Grande, who do more than just sit around 46th Street and Washington. They go out and take a look any time major construction is done, like when the light rail went in. I'm just a spectator of all of this, an interested amateur. And I understand that progress marches on. I wouldn't be able to live in Phoenix if it didn't! So I look forward to the new construction, and I will also be curious to see what the archeologists find. I'll let you know what I find out.